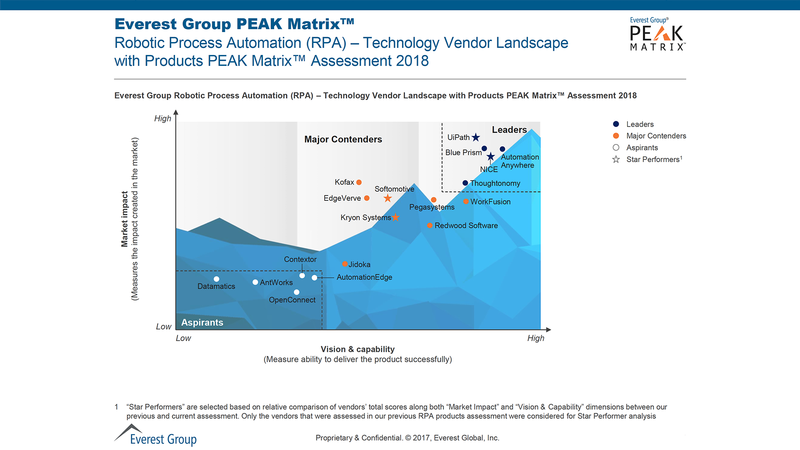 Everest Group evaluated RPA vendors for market impact, overarching vision, and product capability and support. UiPath’s total score along both “Market Impact” and “Vision & Capability” dimensions have propelled us to the highest point of the PEAK as the RPA leader with the biggest impact on customer value, delivered at depth and breadth across geographies and industries. The value delivered to clients and their satisfaction with the UiPath product as well as the support, based on client feedback. Client feedback indicates high overall satisfaction with UiPath’s product, in particular around its ease of use, robot development, flexibility and ease of deployment, and its product vision & roadmap. Clients have also indicated very high levels of satisfaction with its product training and support services. Progressiveness, effectiveness, flexibility, and client adoption of available commercial models. Everest Group is a leading advisor of global services and their yearly comparative analysis of RPA vendors provides a benchmark in standards and quality for the RPA industry, offering RPA adopting companies a point of reference for their vendor selection process. Held our #UiPathForward global events series in NY, London, Bangalore and Tokyo, with more than 4000 guests attending as a testament to UiPath's and RPA’s great current momentum.